A couple of months ago in this POST I talked about a new method I discovered for making snowball blocks. 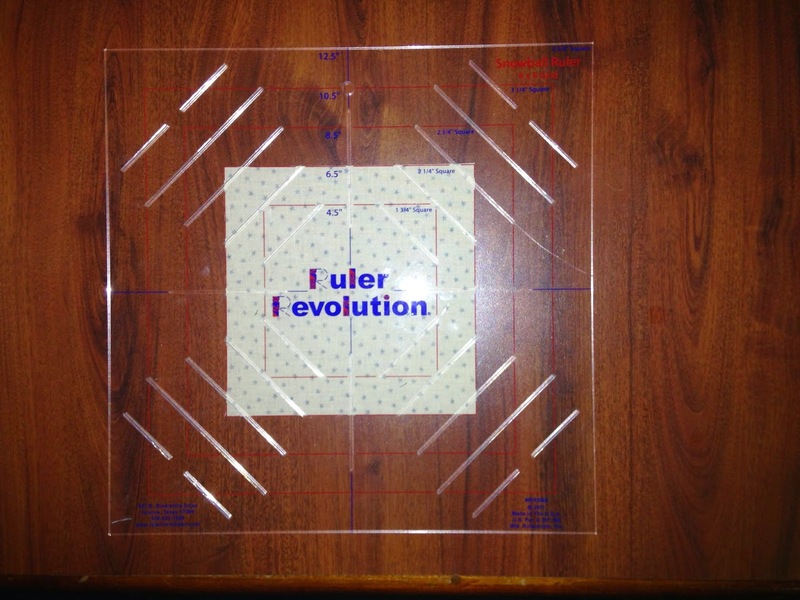 It uses the ruler from Ruler Revolution and it is so easy. So here's the ruler. I'll show you today on Tips, Tricks, and Tuts Tuesday how to make this quick and easy snowball block. 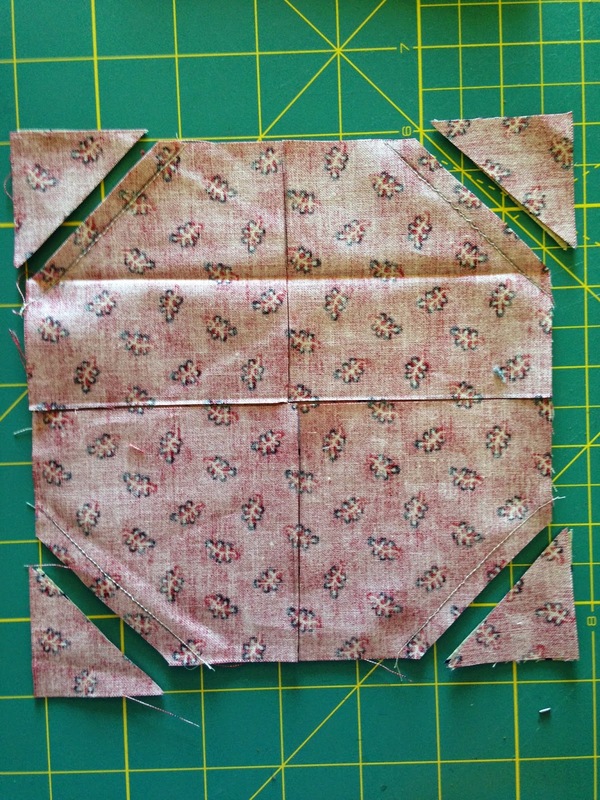 I started by cutting a 6 1/2" background square and a 6 1/2" square from a colored fabric. In my case it is red. You don't have to use a 6 1/2" square, there are various sizes that will work with the ruler. 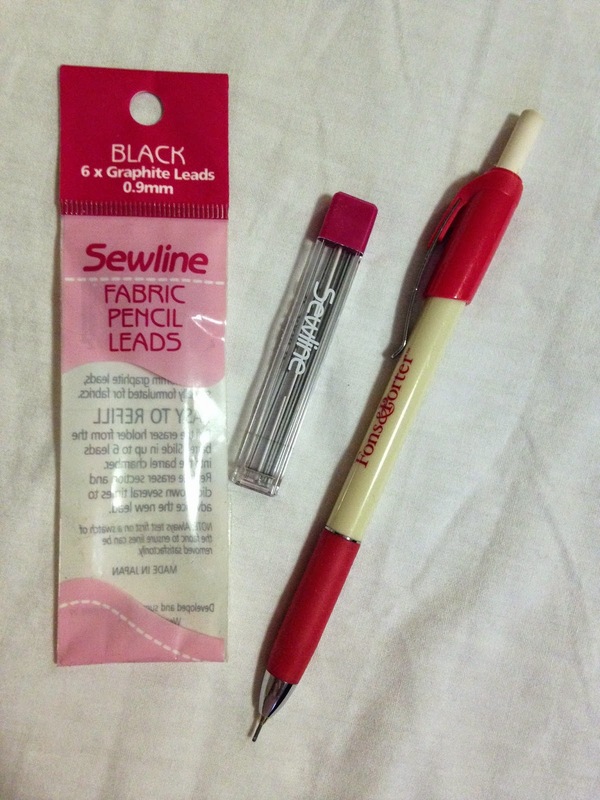 I'm using this marker to mark the lines on my fabric. My favorite is the Frixion pen but the point of it wouldn't fit in the slots of the ruler so I went to my second favorite marking pen. It's from Fons and Porter and works like a mechanical pencil. You can get various colors of lead for it. I have black in it for now. You will want to mark your colored square. You can mark the diagonal lines on the background square but don't cut it! Ask me how I know that. It wasn't a total loss, just a new block for another project. Place the pencil in the slots and draw the diagonal lines across each corner and then the 4 lines going up and down and across. 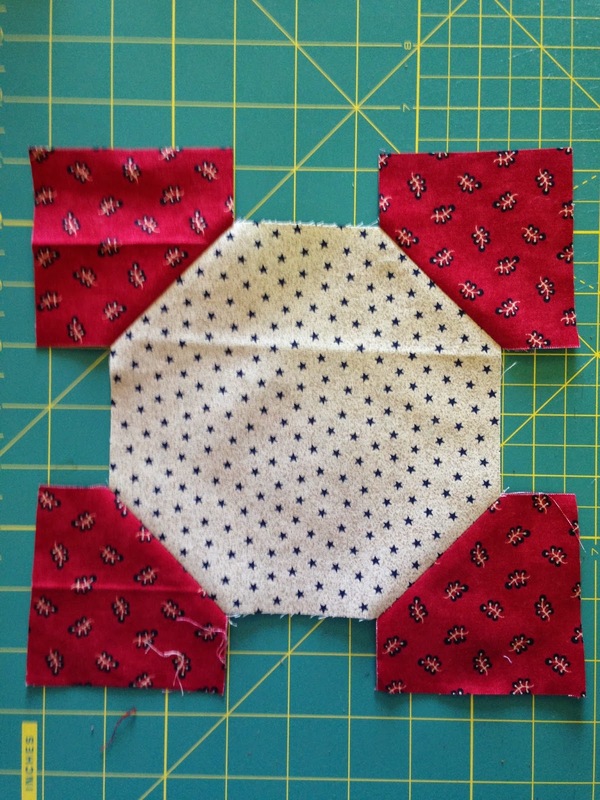 The diagonal lines are the sewing lines and the up/down/across lines are cutting lines. I didn't draw my cutting lines on every square. I drew them of here for you to see. 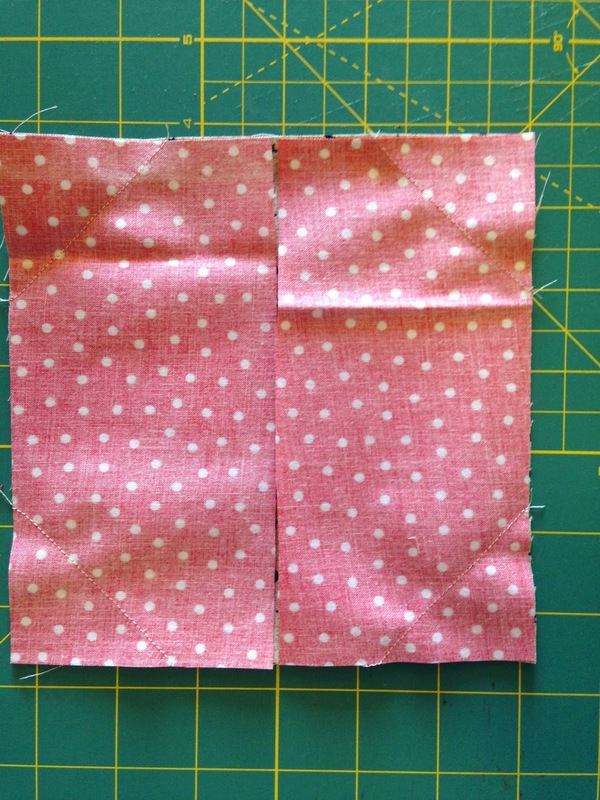 Now sew on the diagonal lines across each corner. I chain pieced my blocks. Even if you're just doing one block, you can still chain piece. 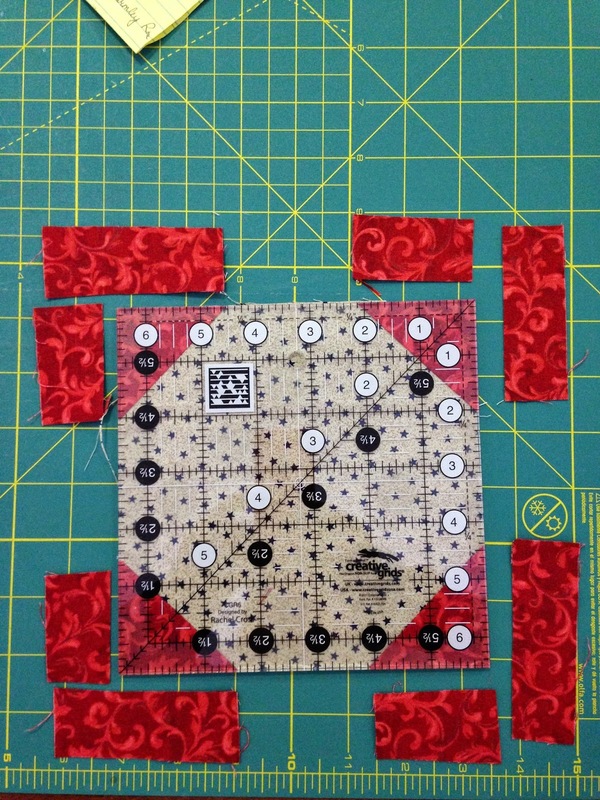 Just left the pressure foot of your sewing machine and rotate the square to the next corner. Now you're ready to cut. If you drew the cutting lines, cut down through the middle and across the middle of the COLORED square. If you don't draw the cutting lines, just eyeball them. They don't have to be perfectly cut down through the middle. 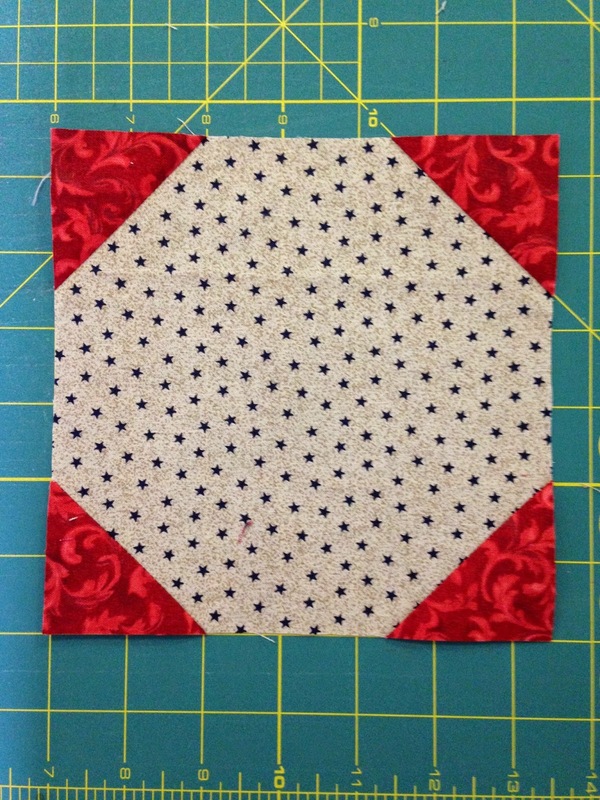 There is a "fudge factor" built in, which is why this block is so easy. 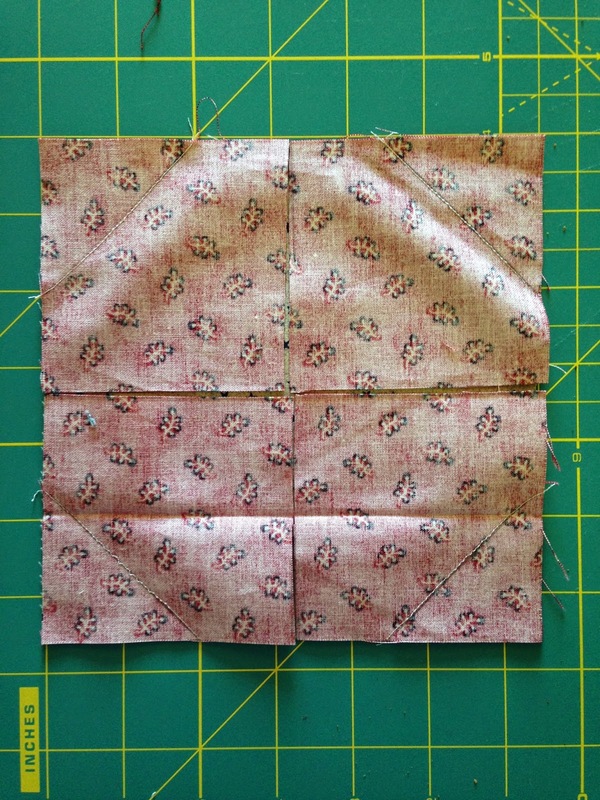 Now snip off the corners, leaving a 1/4" seam allowance. Press the corners out to the colored square. 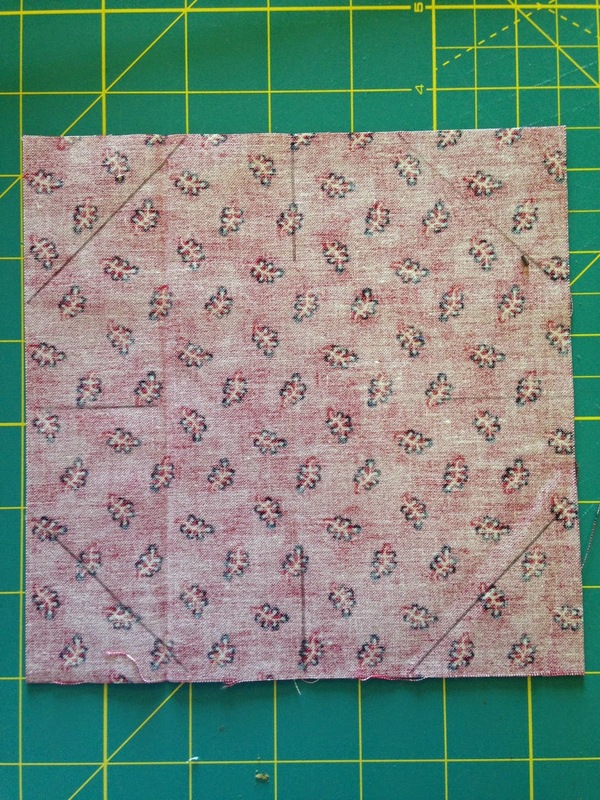 I found that if you don't have a 6 1/2" square but have a strip of fabric, it will work also. 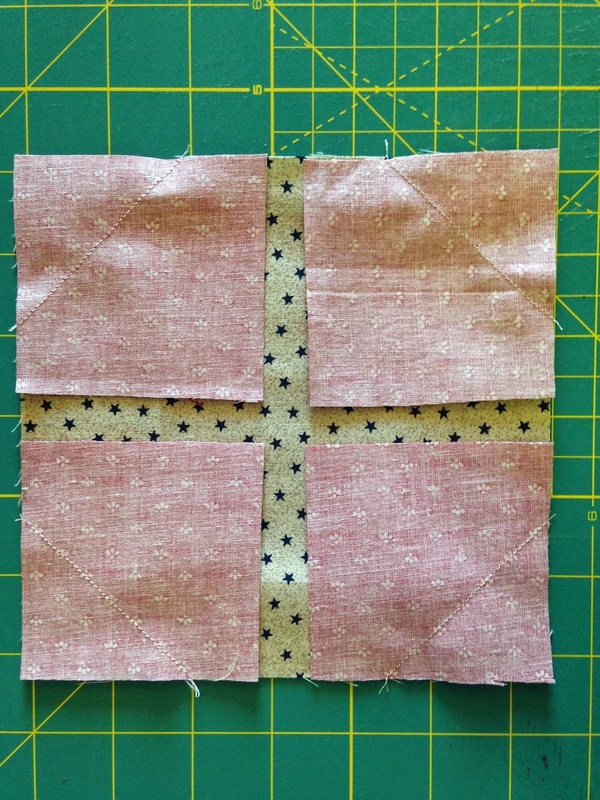 Or if you have pre-cut 2 1/2 - 3 1/2" squares, they will work too. Now the fun part begins. You're ready to square the block up. 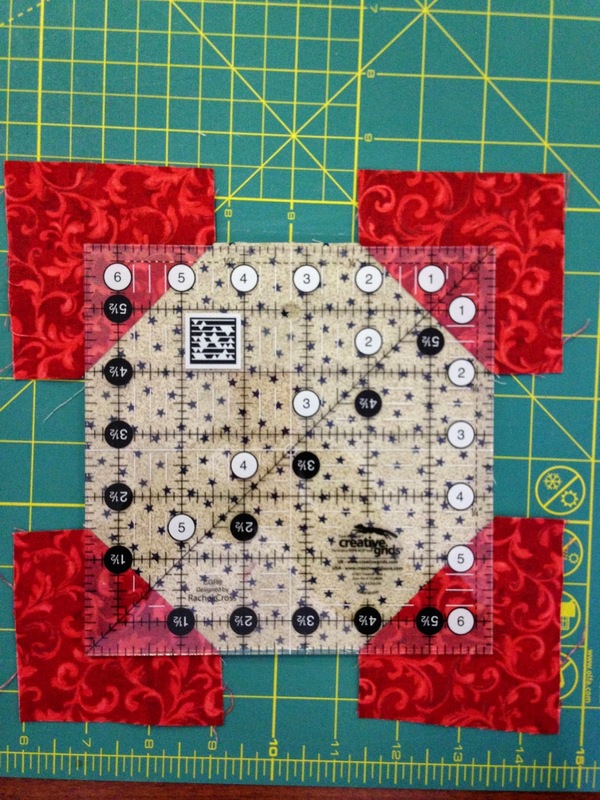 Using my 6 1/2" square up ruler, I lined the edges of the ruler up with the edges of the background square. And TA DA! You have a perfect, easy peasy snowball block. There are 2 sizes of rulers. A 3x3 works with any block that has a 9 patch layout and the 4x4 works with any block that has a 4 patch layout. Come back tomorrow and I'll show you some layouts I've been playing with using the snowball block. 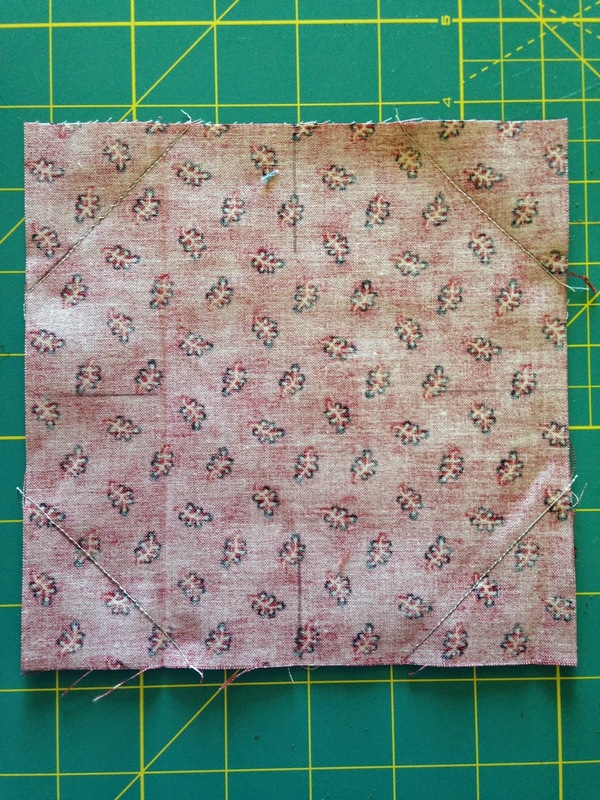 I'm linking up with Lorna at Sew Fresh Quilts on her Let's Bee Social #60. Go over Bee Social with the others posting.